One of my favorite pieces of art in our home is a poster my daughter and I created from an idea I found on Pinterest. 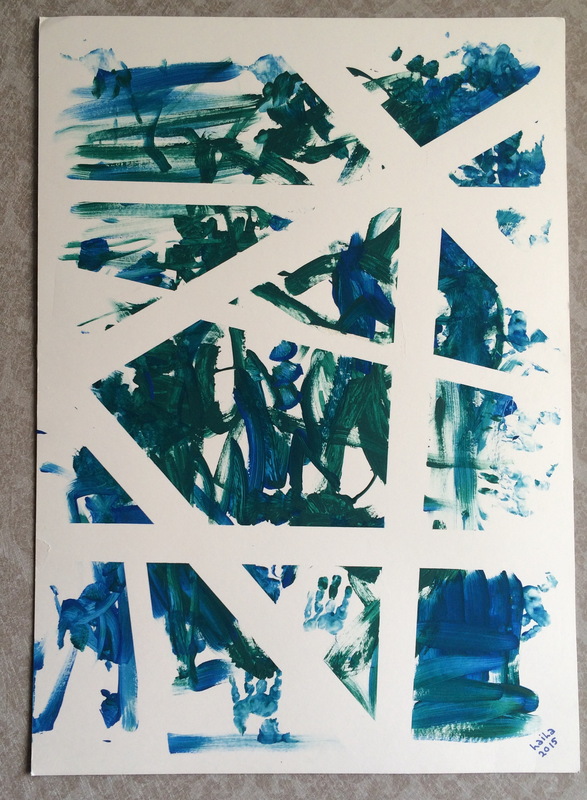 We created this piece when she was two years old. 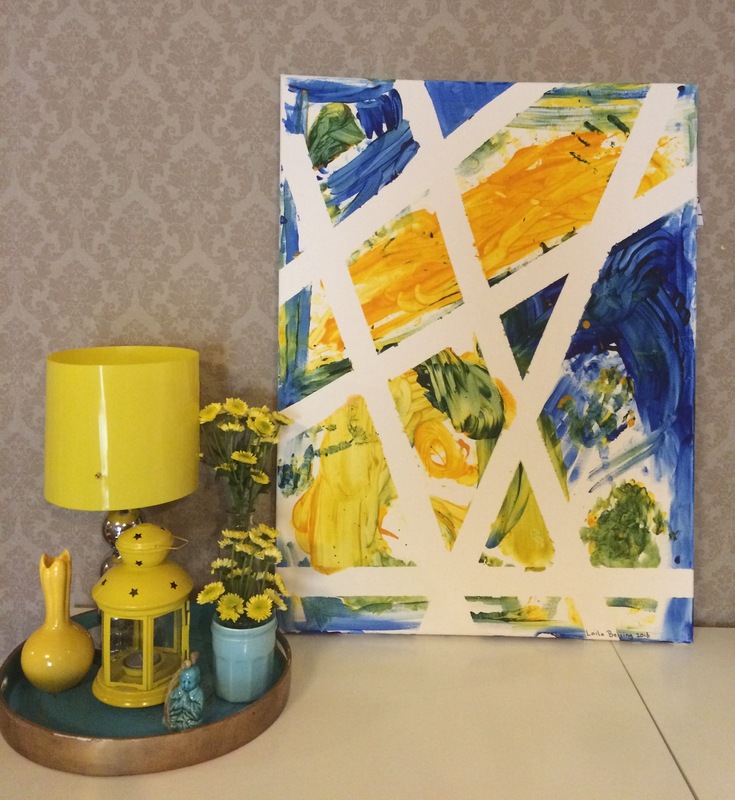 With no money for “real” art, we created our own at home. This piece is easy and fun to make. I wanted to create something similar again but this time on a canvas. 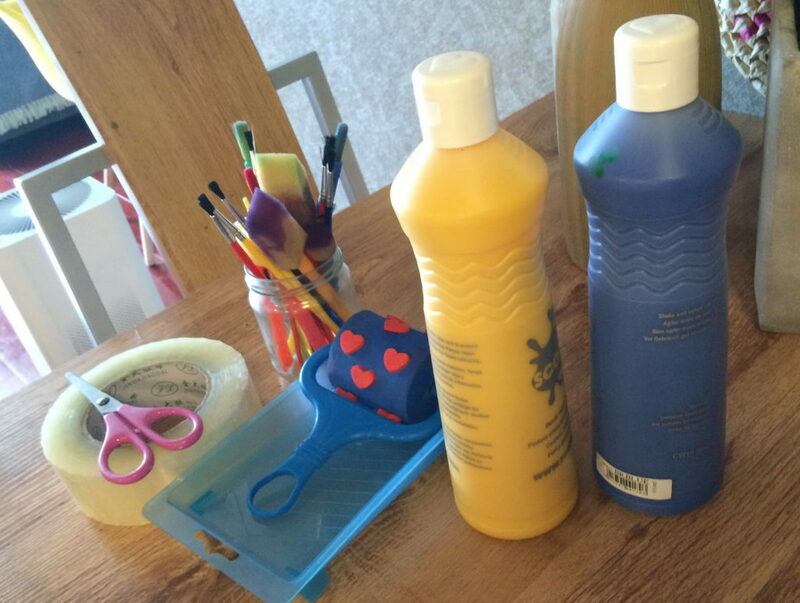 I sourced all the supplies for this craft online, so you don’t have to brave the pollution. I am a big fan of baopals.com because it’s in English and it is easily navigated through WeChat. I bought a canvas sized 60 cm by 80 cm and a roll of tape. 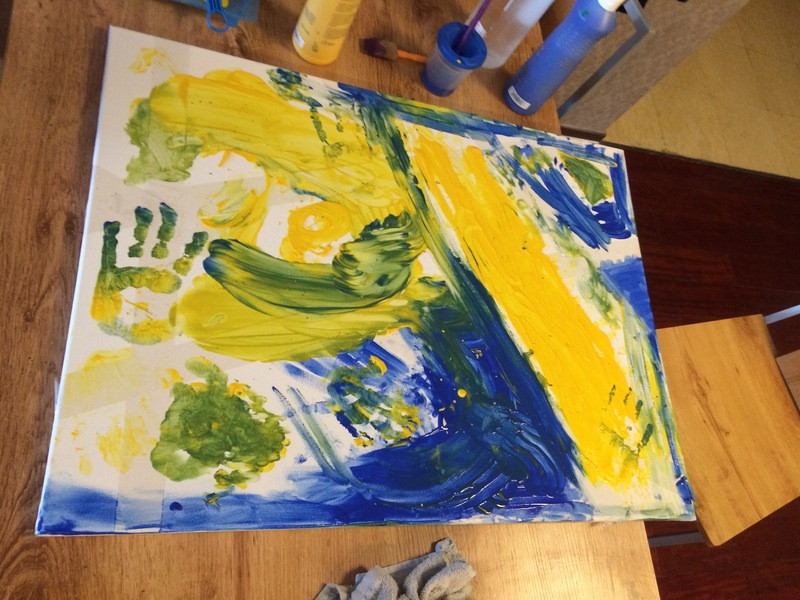 I used kids paint and kids paint brushes.The brushes are not a necessity as hands and feet are more fun anyway. 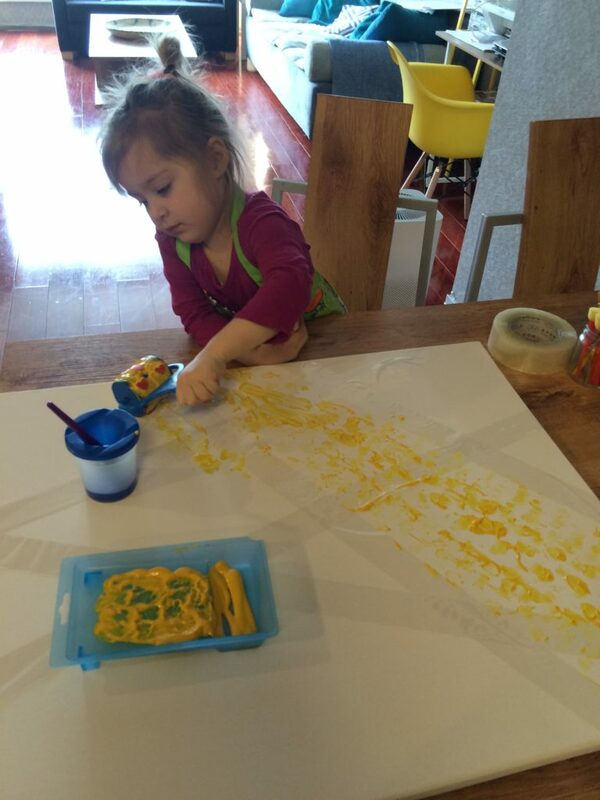 We started with putting the tape on the canvas, then I put an apron on my daughter. It might have been easier to just take her clothes off completely and trow the child in the bath later. It all started off nice and clean, but soon brushes were are thrown aside. I do like a bit of freestyle art, and we even clapped with our paint hands above the canvas for some nice effects. 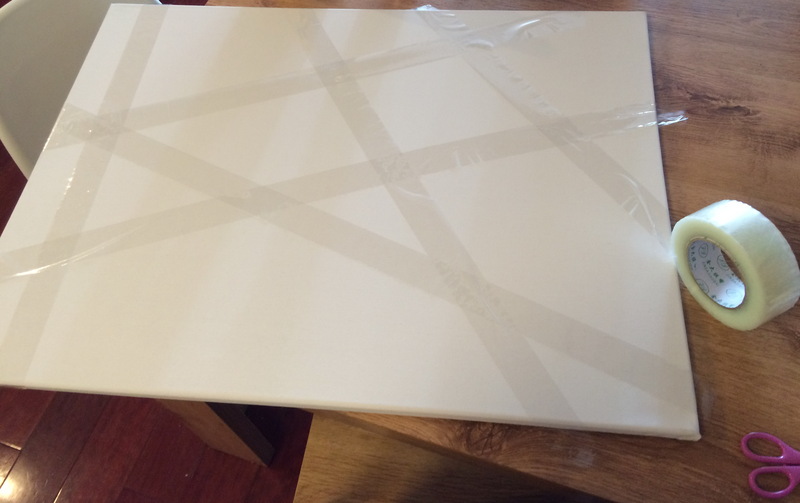 This is how the canvas looked with the tape still on it. I usually let it dry for 24 hours before removing the tape. Sometimes longer if the paint is very thick. And this is the end result after taking off the tape. An art piece worthy enough to hang in the home. This was great to give as a bithday present to somebody who appriciates my child’s art as much as I do. Daddy! Pauline van Hasselt has been working for beijingkids since October 2016. 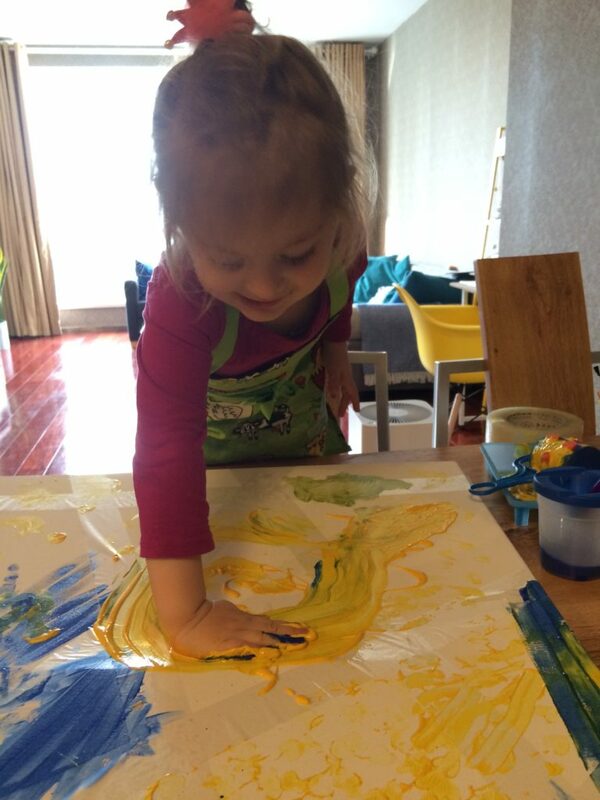 Born in Wassenaar, The Netherlands, she moved with her husband and her 3 year-old daughter to Beijing in June of this year. Prior she lived in the Netherlands, Belgium, Paraguay, Texas, and London, studying and working as a chef. Pauline enjoys biking around Beijing, finding markets and new restaurants, reading crime and fantasy books in bed, and most importantly, turning her house into a home for her family.